All winter long, in the most horrendous of cold and windy and damp weather, I could count on one thing. I knew that the older guy in the black running suit with the white baseball cap would always be out battling the elements too. We always waved and smiled, going in opposite directions. I felt a silent camaraderie with him - knowing that he was so passionate about his running that it didn't keep him from looping the park in a pleasant jog when the wind chill was in the teens. And then, a couple of weeks ago, it seemed we were going the same direction. I saw him up ahead, and thought that perhaps rather than passing I'd slow to his pace and introduce myself. I'm not one to do this - it takes me a long while to warm up to someone - but it seemed almost as though we knew each other, as we had both been in the trenches of some nasty weather running over the previous months. He appeared well into his retirement years, and I admired his fortitude. And so, instead of passing, I jogged alongside and we started talking. He was really quite friendly. He, too, had been happy to see I was the other runner out, the one pushing through the bad conditions. A misery loves company sort of ideal. And, on this day, it was a beautiful and sunny 60* and we had the most fun chatting. It turned out that we had a lot in common. Before his retirement years, he was a social worker, and had his masters in the subject and spent his career at the V.A. hospital helping others. We talked about the rewards and frustrations of such a job. We talked about how the zen of running over the years helps you learn to cope with the stresses. I learned that he qualified for Boston in his youth and ran it successfully. He's been running such a long time that he is now in a place where he's happy to just run for enjoyment, and doesn't worry so much about speed or racing anymore. And then somehow our topic turned to fossils and arrowheads and he began talking about finding fossils in a creek bed in Texas, when he was stationed in Ft. Hood during a stint with the military. And I mentioned in passing that I had gone to college in Texas. 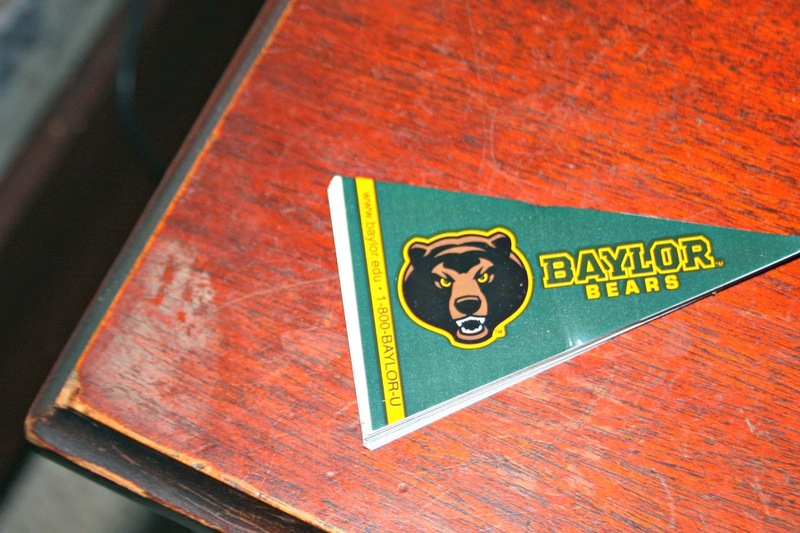 He asked where and I told him Baylor. And do you know what? He went to Baylor too! In all my years in Roanoke, I have not met another Baylor alum. I've seen his car a couple of times (he has a Baylor sticker) - and always wondered. We were delighted - I think both of us had to restrain from yelling Sic 'Em Bears right there. We talked about some of the sociology classes there (I took a few, mixed in with my psychology background). He attended before my time, but was part of the yell leaders for the football team, and played some basketball too. We talked about how bad their football team used to be. And - just like that - I knew I had a new running friend, when I least expected it. Serendipity. What a wonderful demonstration of serendipity in action! Two Bear used to tell me that anyone who catches and holds your attention, even briefly, has a lesson of some kind to share. It's something I've found to be true. It is nice to meet someone that you have something in common with, it seldom happens. That's awesome that you have a new running friend. I think it makes the time pass faster when you do. What a neat experience. You found a friend and running partner. Sick'em Bears. When I lived in Dallas, we used to see them play SMU before SMU was banned from football. I always rooted for the Bears. Now, this is an awesome post. I'm sure he was as glad to meet and talk with you as you were him. That's so great that you found a new friend in such a fun way. It really is serendipitous to find someone you have so much in common with. I remember when I attended Bowling Green in Ohio how thrilled I was to meet the rare person from Virginia. oh i love this story! it really is a small world! That's pretty cool. Definitely serendipity. It's amazing sometimes the things you find in common with people on a random basis. They get put in our path for a reason. Amazing how many people we run across in life ---and when we do start talking to them, we find that we have alot in common. That is SUPER.... Bet you'll see this guy again..
That's a really cool story!! Good for you for visiting with him! Wonderful story! I bet that made for a happy day for both of you. I like how one event can make or break the mood I am in for the entire day. Well good for you!! It is always nice to have someone to run with. Great story and I think he was my neighbor in my old neighborhood. How wonderful! well, I do not believe in coincidences, so you two are buddies now for a reason, and it is a good one. That's cool! When I lived in Savannah, Georgia I ran into someone I went to high school with in Omaha, Nebraska. It's so odd, but cool when things like that happen. It's always good to meet a kindred spirit. Maybe there is something to the concept of fate after all. Oh you picked the perfect word for this post. How neat to have so much in common with your fellow runner- who surely will now be a good friend. Sounds like you two were meant to meet one another. How fun! Baylor is a great school! Glad your willingness to extend yourself and take a chance paid off. We should all follow your lead and introduce ourselves to another. You never know who'll you meet when you're out there. I'm glad you had a wonderful visit with your new friend. And Baylor much be a great place, if it's got Bears! Oh how I just love this. Serendipity. Kismet. Fate. Such a small world isn't it??? So glad you decided to chat him up! Very cool ~ serendipity is such fun. Seems like bumping into an old classmate brought back some wonderful memories. Isn't a wonderful thing to bloom a new friendship? Now I bet you'll have more to say than "hi" next time you pass!